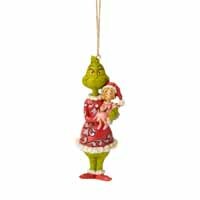 Grinch Holding Cindy Lou | Dr. Seuss Figurines & Ornaments Figurines | One Price Low Flat Shipping! 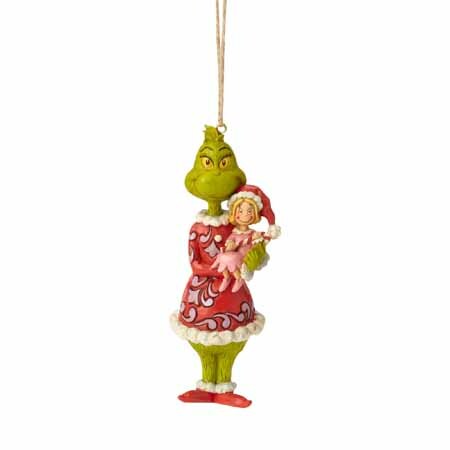 From the Grinch by Jim Shore Department 56 Holiday Collection, Grinch holding Cindy Lou Ornament. Made of hand-painted stone resin. Measures 5" tall. Packaged in collectible Enesco Jim Shore gift box. Cindy Lou sees the good in the Grinch and helps him see it in himself. This heartwarming ornament shows the Grinch holding his new friend, both smiling with Christmas cheer. The handcrafted design is sculpted from stone resin and hand-painted in Jim Shore's classic folk art style.